Sports are a huge part of American culture with die-hard fans rooting for teams ranging from the National Football League to Major League Baseball. These fans go to great lengths to show support for their team and thanks to some credit card issuers, they can also display their team spirit every time they make a purchase. These sports credit cards feature your favorite team’s logo and also offer special discounts for fans. Below we review five cards covering baseball, football, hockey, golf and NASCAR. Show the love to your favorite Major League Baseball team with this card, where you can customize it for free, choosing from the colors and logos of 30 MLB teams. The sign-up bonus is $150 cash rewards bonus after you spend at least $500 on purchases in the first 90 days of account opening. Earn 1% cash back on every purchase, 2% cash back at grocery stores and wholesale clubs for the first $2,500 in combined choice category/grocery store/wholesale club quarterly purchases, 3% cash back in your choice category. It’s also appealing because it offers simple cashback rewards that don’t have to bend over backward to earn or redeem. If you join the Bank of America Preferred Rewards program, you can earn bonus points of between 25% and 75%, depending on whether you have gold, platinum or platinum honors status. After hitting a $25 rewards balance, redeem them for a statement credit, a check, or electronic deposit into a Bank of America checking or savings account or contribute to an eligible Cash Management Account® with Merrill Lynch Wealth Management® or Merrill Edge®. The information related to the MLB™ Cash Rewards Mastercard® from Bank of America has been collected by CompareCards and has not been reviewed or provided by the issuer of this card prior to publication. Read our review of the MLB™ Cash Rewards Mastercard® from Bank of America. This credit card is a must-have for any National Hockey League fanatic. It comes with features of all Discover cashback cards — including Discover will automatically match all the cash back you earn at the end of your first year — but also has some nice built-in perks for hockey fans. Cardmembers earn 5% cash back at different places each quarter like gas stations, grocery stores, restaurants, Amazon.com and more up to the quarterly maximum each time you activate. 1% cash back on all other purchases. Cards can be customized with an NHL team logo on the front. You also get a 10% discount when shopping online at Shop.NHL.com and NHL.TV™ when using the promo code “ITPAYS” at checkout. 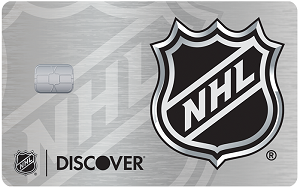 Read our review of the NHL® Discover it® . For fans who want to show their loyalty to their favorite NFL team, this is the card to have. New cardholders Earn 10,000 bonus points after $500 in purchases in the first 90 days from account opening. Cardholders earn 2 points per $1 on NFL or team purchases and 1 point per $1 on all other purchases. Want to buy some NFL team swag? You’ll get a 20% discount for every $100 spent if you use the card at NFLShop.com. Redeem your points for rewards including NFL gift cards, NFL-based experiences, game tickets and cash back as a statement credit. This official PGA card is the one you want in your wallet if you’re serious about your golf. New cardmembers can Receive 2 tickets to the PGA TOUR® event of your choice if you make at least $95 in transactions in the first 90 days of account opening (students not eligible). You earn 1% cash back on purchases everywhere, every time, 2% at grocery stores and wholesale clubs and 3% on gas for the first $2,500 in combined grocery/wholesale club/gas purchases each quarter. Perks that come with this card include premier access to participating resorts, daily fee and private Tournament Players Club (TPC) golf courses across the country. That comes with discounted greens fees and a 20% discount on regular-priced merchandise at TPC Shops when you use the card. You can bring three guests based on availability or course guest policies. It includes range balls and cart fees, dedicated lockers and a welcome gift at the course. Read Which Credit Cards Offer the Best Golf Perks? Credit One Bank is known for offering cards to people who have had financial issues in the past and are looking for a second chance. One of those cards is the Official NASCAR® Credit Card from Credit One Bank®. You’re required to pre-qualify for the card and it’s done via a soft pull inquiry. This means that it won’t hurt your credit score if you’re not eligible for the card. Credit One will automatically recommend cards you may be eligible for. Credit One cards don’t come with a sign-up bonus. But cardmembers earn 1% Cash Bank on Eligible Gas and Automotive Purchases and Double Cash Back at the NASCAR.com Superstore, terms apply, categories that are attractive to NASCAR fans. 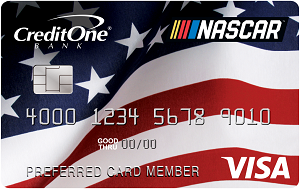 Read our review of the Official NASCAR® Credit Card from Credit One Bank®. Each of these credit cards offer solid features and rewards for sports fanatics. But know that there are other reward cards on the market that offer more points per dollar spent in the top categories — travel, dining, gas and groceries. If you don’t mind the lower rewards, then apply for these cards and put your fandom on display.